Elizabeth gets bored really, really quickly. Especially when doing things that have to be done - like having her hair brushed, getting dressed, or eating. Especially eating. My sister suggested she have a couple toys or books at the table to keep her distracted from eating happy. It really works! She has designated books to read at the table, because now that she is feeding herself, everything gets pretty gross and caked up with banana and cereal, and she sometimes does finger painting with drops of milk. It's pretty gross, actually. Her eating-books have to get washed after every meal, just like her dishes. As a result, some of her favourites are all scratched up and the colour is fading from frequent wipings, and we've had to tape up the bindings on a couple. So chavvy!! Lately, Elizabeth has been like a sponge for new words and new signs, so she can actually tell us what book she wants. She does the sign for book, and then signs & says "fissssssssssshhhhhh" for the dolphin book. And she says "puuhhhhpppppppyyyyy" for the dog book, and if she says "baybay" it is either 'Me Hungry!' or 'Tickle, Tickle'. If she puts her hand on her head, she means 'The Paper Bag Princess', because they all wear hats (crowns). because then she 'gently, gently' brushes her own hair, and gets peanut butter and jam in her hair. Nice. My favourite is 'Me Hungry!' because Eliz can actually read most of it on her own. It was a gift from Auntie Ali, and is the story of Edwin the caveboy, who wants a snack, but the Daddy and Mummy Cavepeople are too busy, so Edwin goes hunting on his own. Elizabeth does the signs for rabbit, and says 'rawr' for the tiger, and does the sound of an elephant when he runs into one. 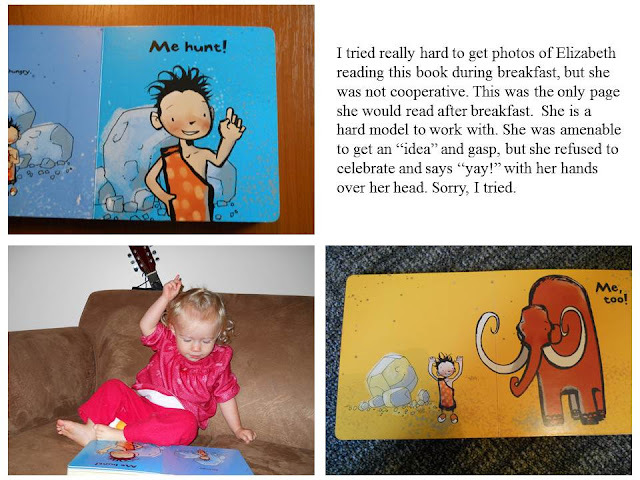 She also mimics the little boy's expressions on each page. Matthew's favourite book is 'The Paper Bag Princess' for a couple of obvious reasons: (1) The Princess' name is Elizabeth (!) and (2) the other main character is a dragon, and when Matthew reads it out loud, the dragon sounds like Jabba the Hut.